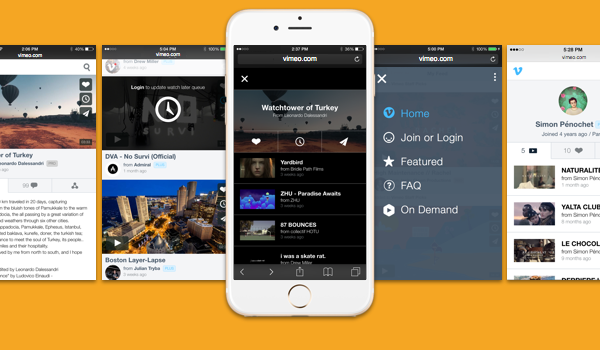 Video service Vimeo is out this morning with a faster, revamped mobile website that reduces clutter, improves performance and lets users interact with the service while logged out. On the updated site, users who aren’t signed in can like videos and even add them to a “Watch Later” list to save them for future viewing, the company says. The service is also hoping to increase users’ time on site to extend beyond the single video viewing with a new experience focused on showing users more recommendations as well as other sharing options after the video completes. The site’s layout is different, too, featuring a search box at the top and is today displaying a yellow bar at the top encouraging logged out users to join for free. Following that, the rest of the site is a scrollable list of popular videos from across the network. If you choose to log in and haven’t done so in a long time, this may be the first time you’re reminded that Vimeo reset your password on your behalf following the Adobe cyberattack that compromised a number of online IDs and passwords for Internet users. (Vimeo wasn’t itself compromised, but forced users to change their passwords as a precaution.) When you jump through those hoops, you’ll be able to access your feed and profile and other areas designed for logged in users. The navigational controls are a bit hidden now in the new site. You tap the small blue “v” to be shown the side menu where you can access your personal feed, your profile, view Featured videos, the On Demand section, or your Watch Later list. Users who also upload videos can upgrade their account from this side menu as well in order to increase their storage. Other features are even further buried in a sub-menu you access from the top-right of this one, allowing you to manage cookie and language preferences, as well as view the desktop site and more. The company says the upgraded site is just the beginning of several changes ahead, including planned integration with Vimeo’s mobile apps. Though vastly smaller than YouTube, Vimeo is still one of the top digital media sites today, with over 55 million users as of September according to comScore. The company reported earlier that over half of its traffic came from mobile devices. The experience Vimeo has created today with the site upgrade makes better sense at a time when users are browsing videos not through a dedicated app, but by clicking links on social media, like Facebook and Twitter. After viewing the video, the hope is that the users will continue to surf around, share the video with friends, and maybe even create an account. CTO Andrew Pile previously spoke of Vimeo’s mobile challenges, saying that a “huge percentage” of Vimeo’s traffic was sandboxed inside other apps like Twitter. “On Android it can be different, but on iOS you can’t be logged into Twitter and Vimeo at once,” he had told CNET. The updated site with the features designed for logged-out users helps to solve that problem, it seems.